Last week Slobodan Pilipovic, authorized representative of the company Ludwig Pfeiffer, signed the contract for our first project in Somaliland. As part of the project, approximately 149 km of potable water pipes will be laid and four water reservoirs will be built. In addition, a basic sanitation with public toilets, a small wastewater treatment plant and septic tanks will be implemented. 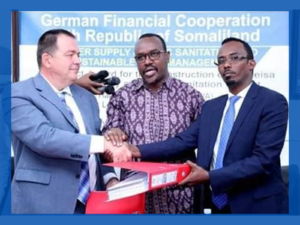 The purpose of this project, which is financed by the German financing bank KfW, is to improve the drinking water supply and access to basic sanitation of the predominantly poor population in the underserved districts of Hargeisa in a sustainable, socially and environmentally sound manner. “Somaliland” declared its independence in 1991, but is still not recognized internationally. Political instability prevented much needed investment during the ast years. Due to the large population growth and the continuing influx of refugees, today’s access rates to adequate water supply in Hargeisa are low.